When visiting New York City we are almost always drawn right to Times Square. It’s a place you’ve seen on TV and in the movies so many times that when you are there for the first time it seems like you’ve been there before. But over the years each time I visit the crowds just seem to get bigger and bigger and my patience grows smaller and smaller. On this trip I did have a few places near Times Square to visit but first I was taking a break from the crowds. As I walked down 12th Avenue towards the Lincoln Tunnel I saw a sign that told me I was closed to my next stop. 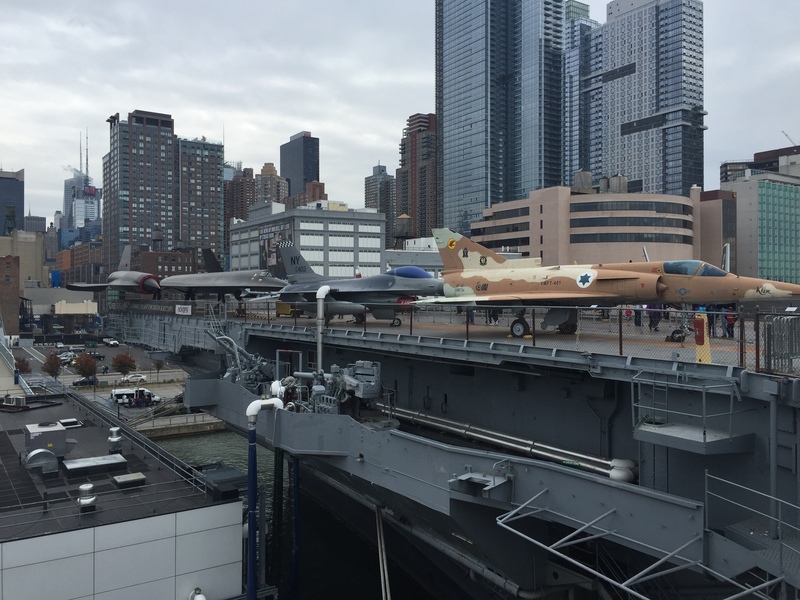 The Intrepid Sea, Air & Space museum has been on my to-do list for years, but it is a little out of the way from where we usually visit in NYC. 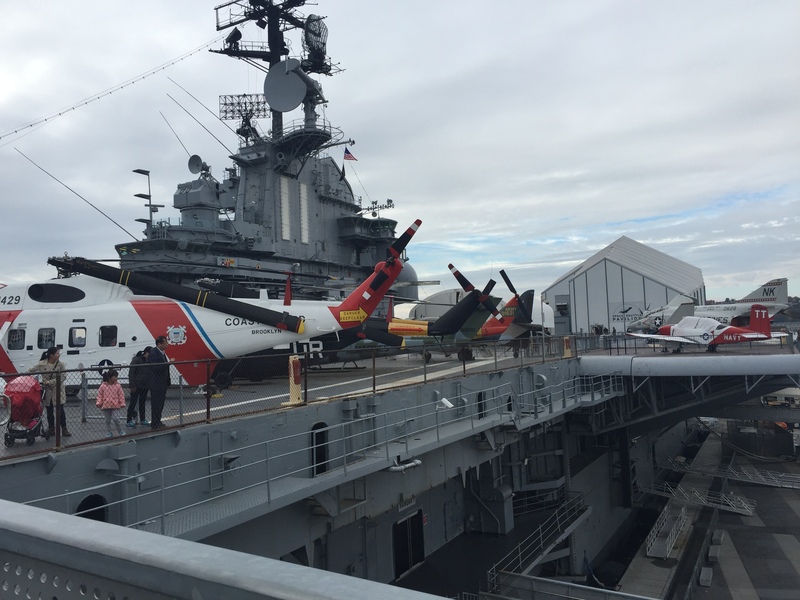 This trip I was making sure to head over because I couldn’t wait to step aboard an actual Aircraft Carrier. 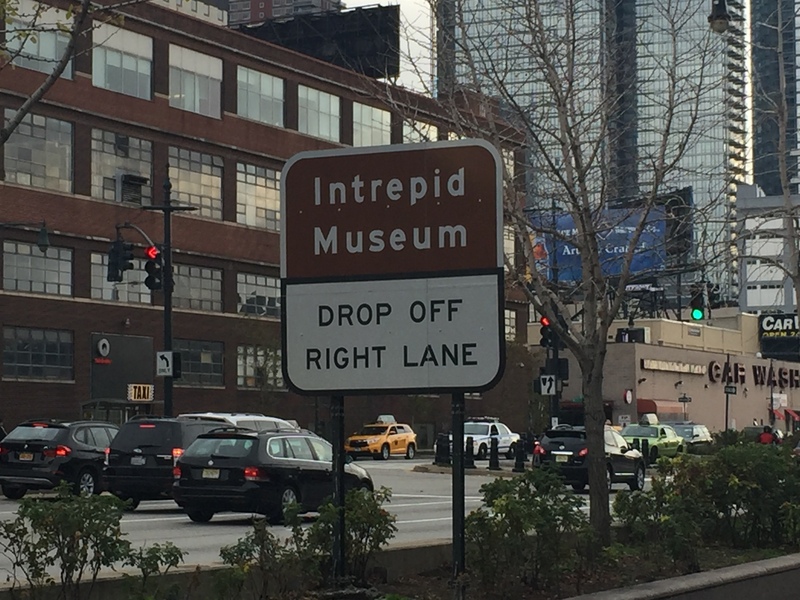 The museum was originally founded in 1982, but was closed in 2006 for a two-year renovation. 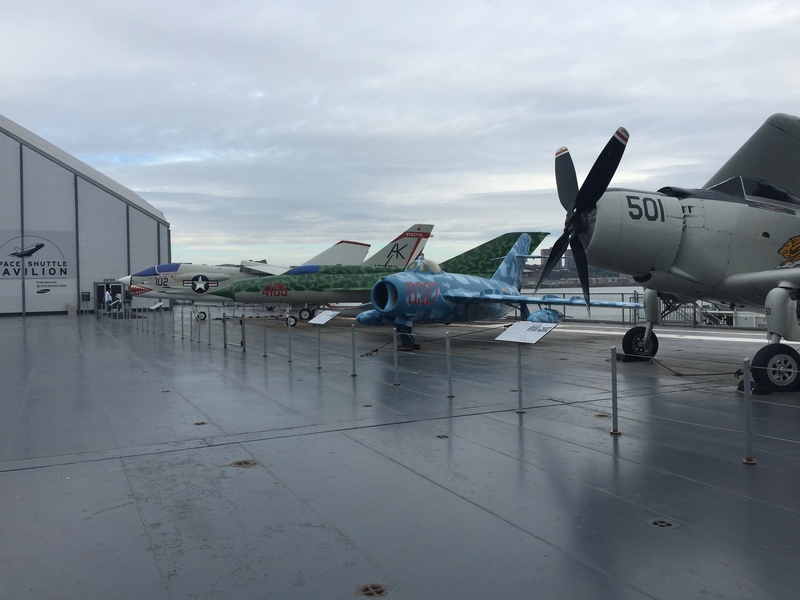 It is a military and maritime museum that houses numerous aircraft on board for visitors to see and learn about. 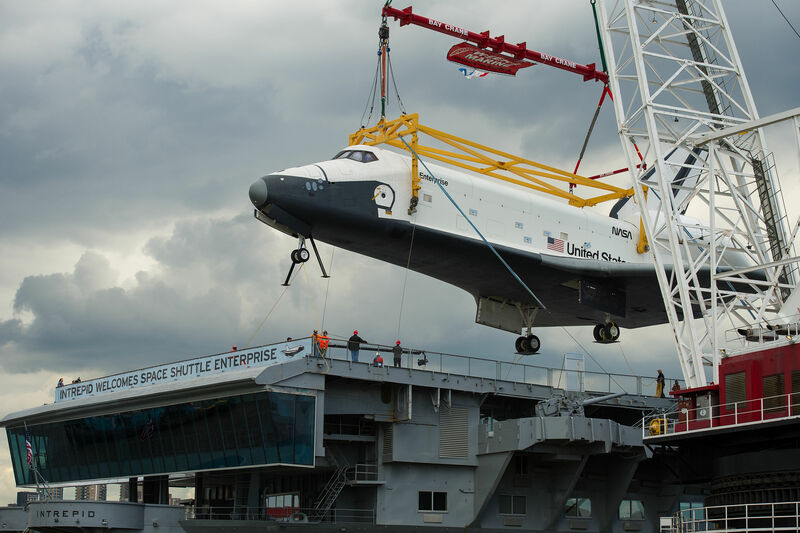 A recent additional to the museum that opened to the public on July 19th, 2012 was the Space Shuttle Enterprise and is now located in the Space Shuttle Pavilion on the top deck of the Intrepid. 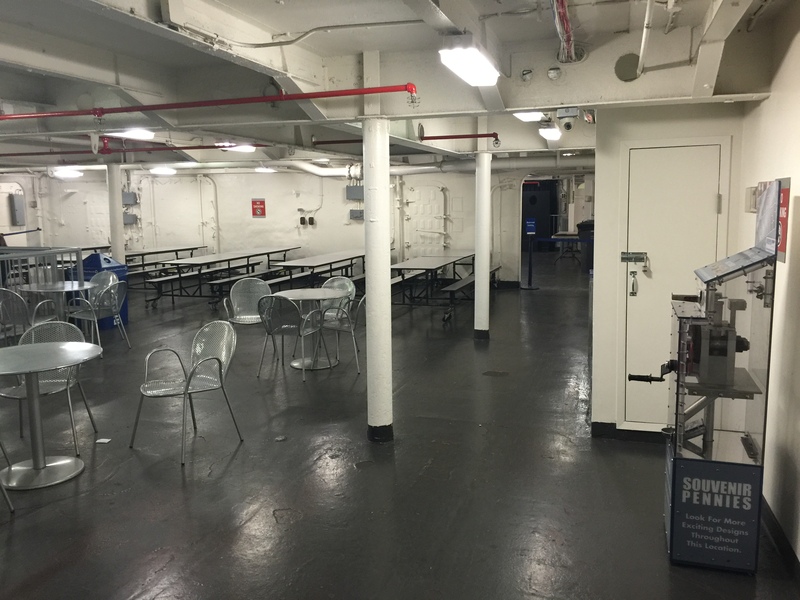 The Intrepid has some tight security before you can access the pier. 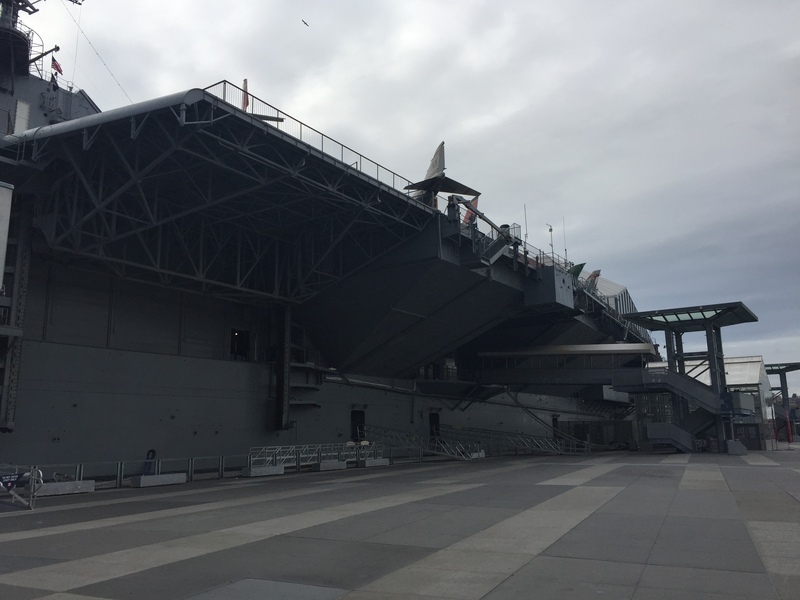 I had paid for my ticked online the night before so I was able to skip that line, and head right out onto the pier where the sheer size of the Intrepid became apparent. 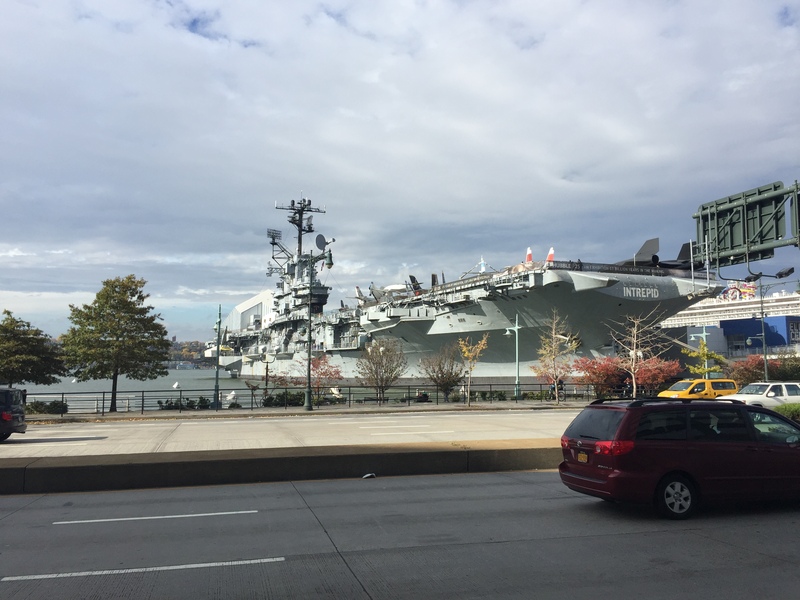 Before boarding the Intrepid there are some things to see and do along the pier but still require admission. 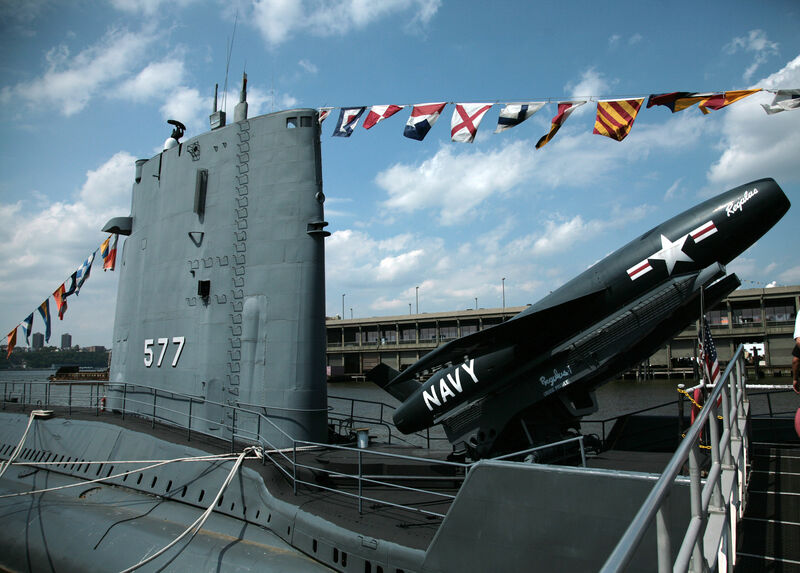 The submarine USS Growler was a cruise missile submarine whose mission was to provider nuclear deterrent capabilities. This was done off the west-coast of the Soviet Union during peak years of the cold war. I was about to check out the Growler but something else on the pier caught my eye and was immediately drawn to it. 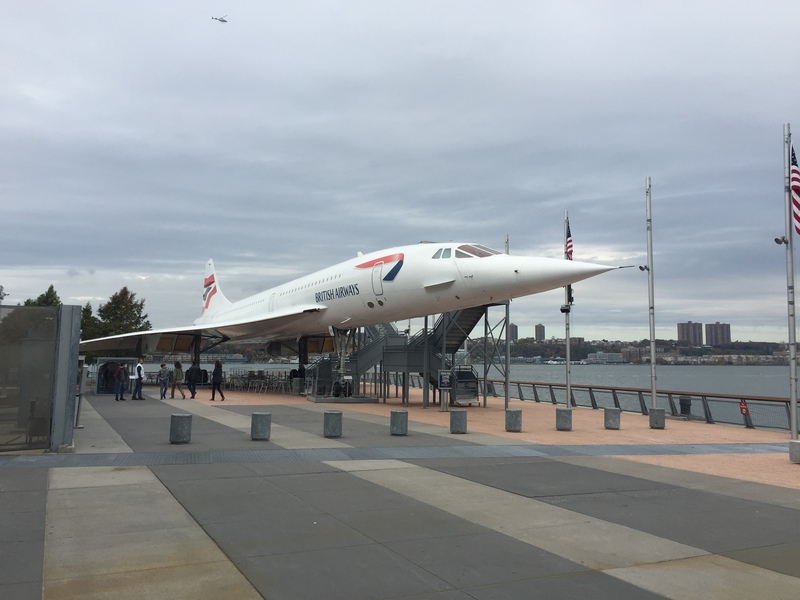 The British Airways Concorde SST. It was a supersonic passenger jet that featured a maximum speed over twice the speed of sound at Mach 2.04. First flown in 1969, and eventually entered service in 1976 and continued commercial flights for 27 years until 2003 when it was retired. This aircraft was beautiful and really mesmerizing. 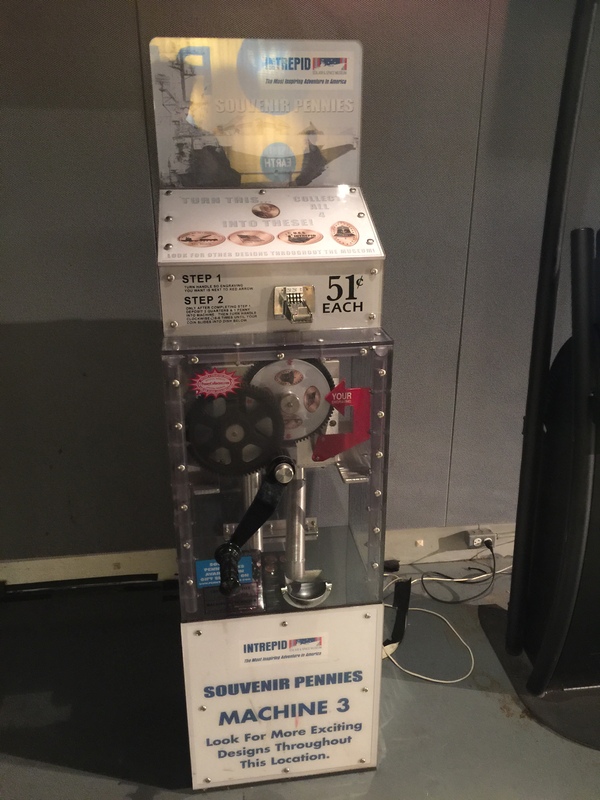 After taking my pictures and reading all the information they had on display I turned around and came face to face with a penny machine. What can I say I’m obsessed! 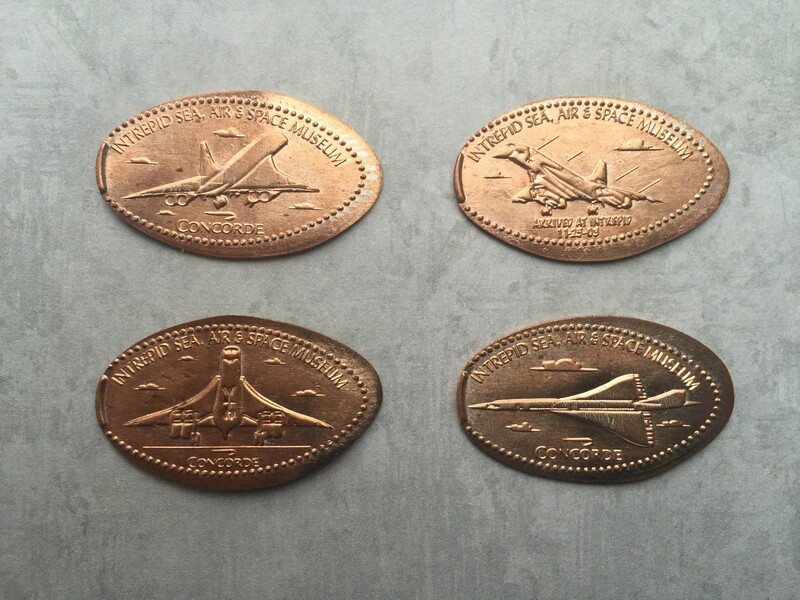 What was even better was that this coin set was all about the Concorde. I put my first set of coins in the slider and as I pushed it in….it jammed. I couldn’t believe it. Taking a few minutes I tried to get the slider back out, but didn’t want to make things worse. So a little dejected I had to move on without getting this set. As you can see from the above picture of the machine marquee the four designs included the Concorde in various views of flight. I was a little bummed about the machine but quickly remembered that I had a huge Aircraft Carrier in front of me that I hadn’t even stepped onto yet (oh and there were two more machines somewhere). I decided to take the elevator up to the stop deck and work my way back down. After getting off the elevator I snapped the above two pictures in an attempt to show how big the flight deck was by the number of aircraft located here. In the picture on the right in the back you can see the Space Shuttle Pavilion “Tent” that houses the Shuttle. I walked onto the deck and saw another aircraft I had been obsessed with as a child. The Lockheed A-12 was a reconnaissance aircraft built for the CIA by Lockheed and had the internal code name “Archangel”. 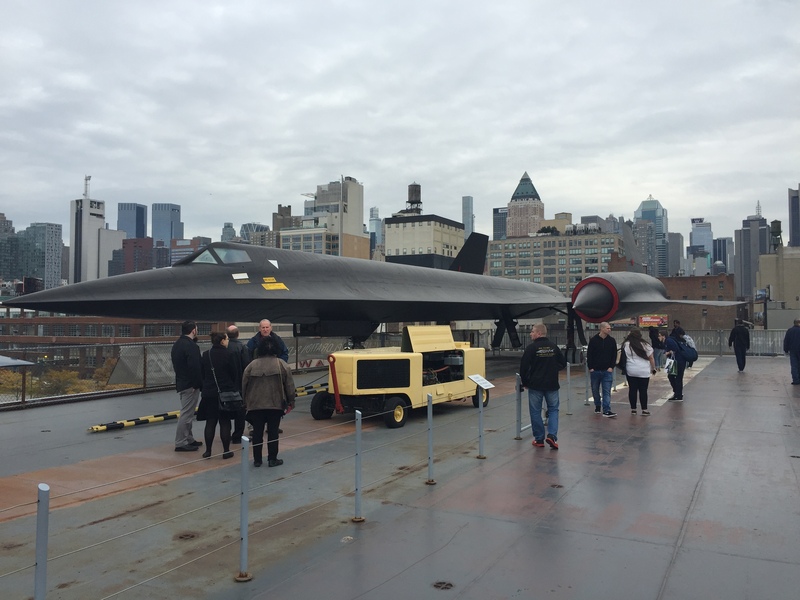 It was the precursor to the famous SR-71 Blackbird also created by Lockheed. Also on the deck from the US Air Force was an F-16 Fighting Falcon. From the US Navy was an A-4 Skyhawk, F-8 Crusader, an A-6 Intruder. From the US Marine Corp was an AV-8C Harrier which is really cool, this plane can take off and land vertically. Lastly from the US Army a Vietnam-era UH-1 Iroquois. These were just some of the amazing machines that you could get up close and personal with. I actually spent a lot more time here than I had initially planned for but I just couldn’t pull myself away. Due to time I didn’t go check out the Space Shuttle but I really kick myself now for not doing so. There is a separate admission to see it, but after coming home I have seen some pictures online and it just looks amazing. This just means I’ll have to go back and see it in the future. Anyways, with the top deck done I took the elevator down to the next level. Inside there were more plans, and as you can see from the above picture even one of the ships propellers that made this monster craft move. Towards the far end was the Exploreum that has some interactive exhibits for the young (or young at heart) to play with. Over in a small alcove I found the next penny machine. To be honest if I wasn’t specifically looking for this machine I probably would have missed it. It just off to one side underneath a kind of platform. 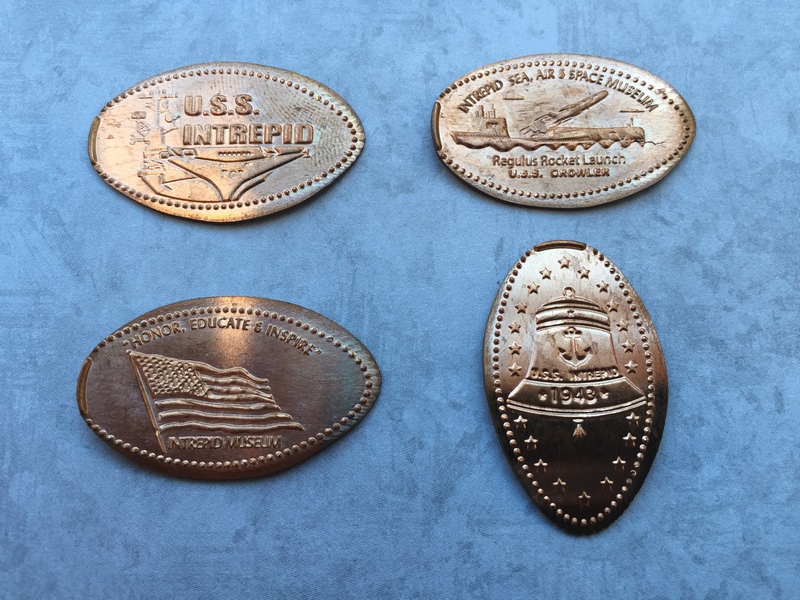 The four penny designs at this machine were an image of the U.S.S. Growler, an American Flag “Honor, Educate & Inspire”, the U.S.S. Intrepid, and the U.S.S. Intrepid 1943 Bell. 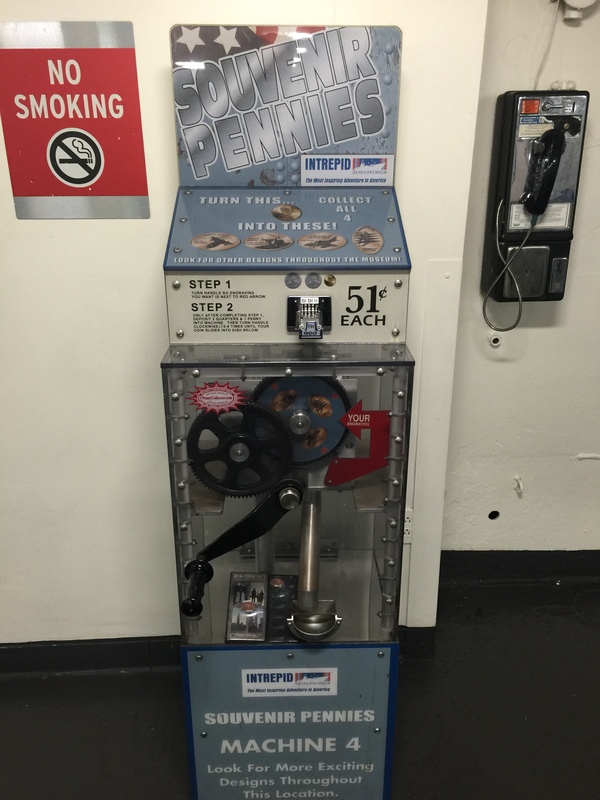 After storing these pennies away I began to look for the last machine located on the Intrepid. I had a rough idea where it was but wasn’t exactly sure how to get there. My online research said it was near the mess hall / food court but the map I was given didn’t really say how you got it to. I eventually asked someone and they pointed me towards a door that revealed a set of stairs. After doing down a few flights I came out in the food court. As you can see in the above picture the machine is located on the right side just outside the restrooms. This place was pretty deserted even though the rest of the museum was fairly busy. I assume from the lack of signage not many people know how to get here. 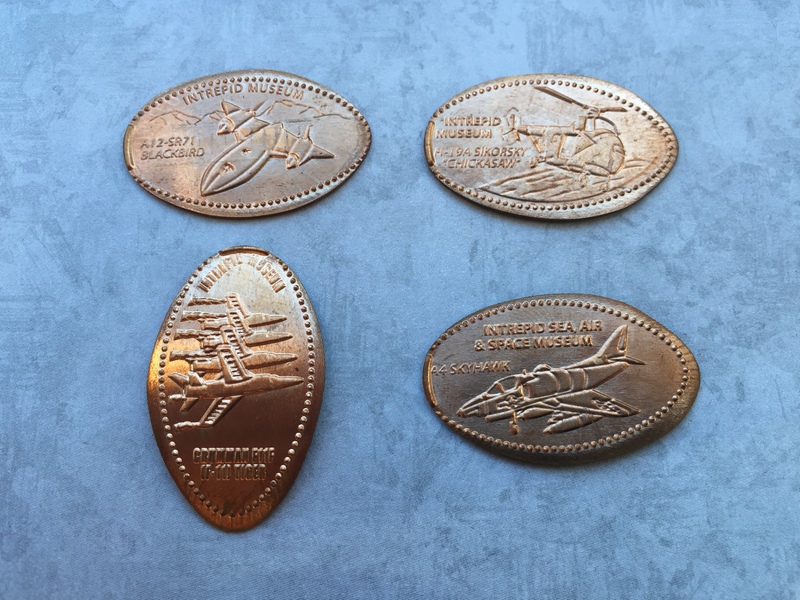 The images on these pennies were the Lockheed A-12, the H019A Sikorsky, the A4 Skyhawk, and the Grumman F11 Tiger. Apparently I wasn’t the only one looking for this machine. As I started to pretty my set there was another couple that entered from the stairwell and came right up beside me. 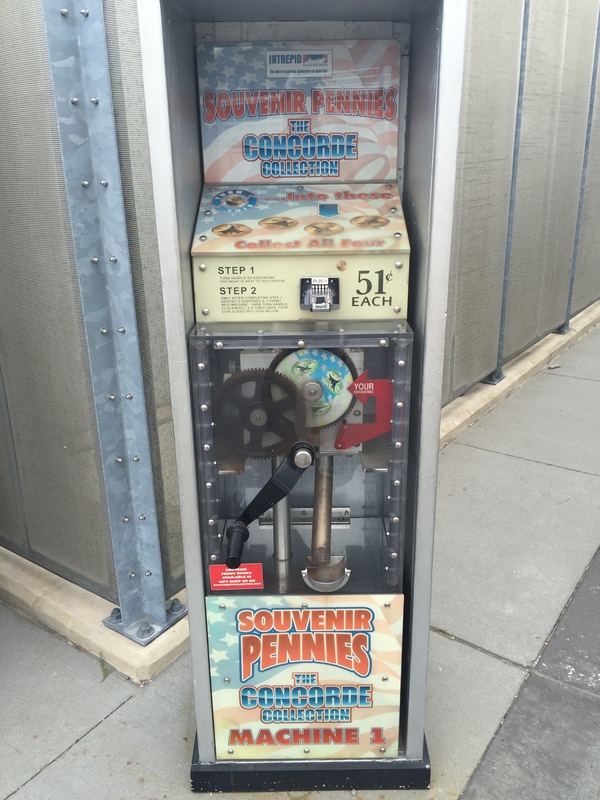 We spoke for a little bit and I found out they were new to collecting pressed coins but were having a great time coming across machines throughout the city on their weeklong trip. I immediately welcomed them to the hobby and told them all about TEC (The Elongated Collectors) and Pennycollector.com for all their future trips. They were very thankful for the information which I’m always more than happy to pass along. With a smile on my face I headed back to the stairs and went all the way back down to the pier and towards the exit. 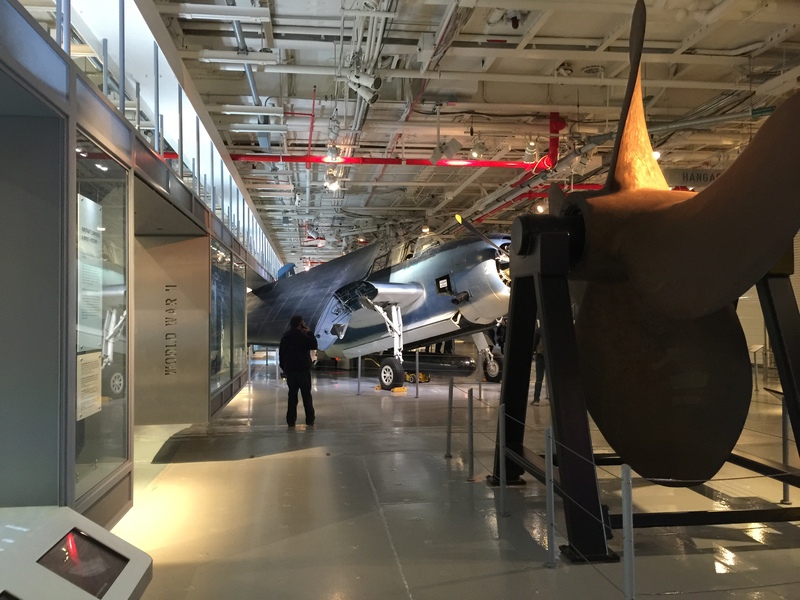 For anyone in military history, or airplanes in general this is really a great place to check out. Unfortunately I had put off Times Square as long as I could and started to head back in that directly. There were still a bunch of places I had to visit and the large crowds weren’t going to make it easy. 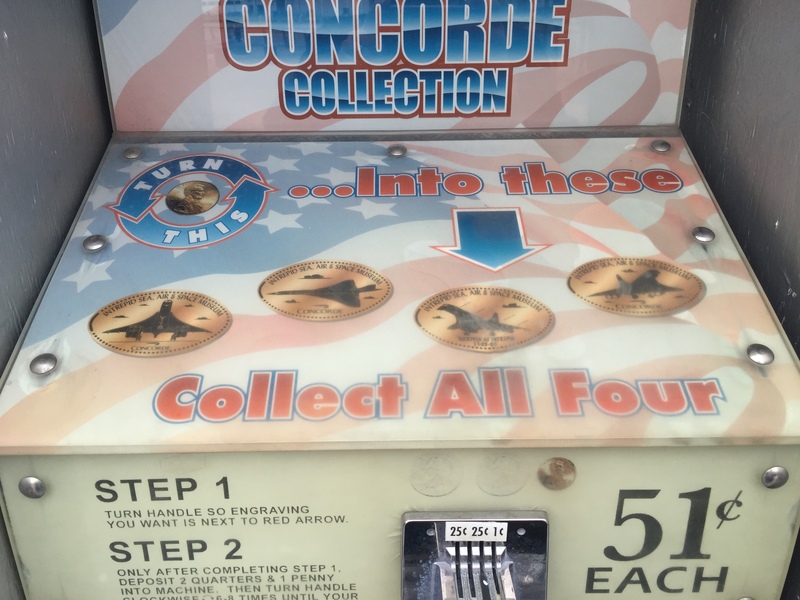 ** Updated: After I got back home I waited about a week and then sent my letter to the Intrepid explaining that the machine by the Concorde had been out-of-order and asked if someone would mind pressing me a set. I had included a set of quarters and pennies as well as a self-addressed stamped envelope to aid in returning them to me. I kind of forgot about it for a couple of weeks until one day I came home and there was a FedEx package on my front step. I opened it to find a very nice letter from one of the management staff at the Intrepid. They apologies for the machine not working and send me a set of the coins, but also returned my quarters and pennies because of the inconvenience. This just made my day and I always really appreciate when these placed take the time to help our their guests whenever possible. Thank you Intrepid Crew! !